Enchanted forests. Evil step-mothers. Strange, wondrous creatures. At a certain age, isn't it time to put away such childhood fantasies? Damaged but beautiful bail bondswoman Emma Swan (Jennifer Morrison) thinks so. Tough yet troubled, she has no time for fairy tales. But when a child from her past (Jared Gilmore) finds her and takes her to Storybrooke, a town harboring fairy tale characters lost in time, Emma must consider that the unimaginable may be, in fact, closely linked to her life. Not that is seems that way at first. The inhabitants of Storybrooke don't know they're fairy tale characters. They are living a puzzling, but rather sedate, lives, victims of a curse that has robbed them of their wonderousness. The pilot of this show follows the fairy tale beings as they fight the evil curse, and Emma, who occupies the present, continuously skeptical of the magical events surrounding her. The first thread features Snow White (Gennifer Goodwin) and the very cute Prince Charming (Josh Dallas,) who fight a curse while protecting the destiny of their unborn child. The second thread, Emma Swan's story, lacks the magic of Snow White's yarn, but remains very entertaining, mostly due to the immense likability of Jennifer Morrison's character and performance. Emma Swan is a very empathizeable heroine, tough but troubled, sassy yet scared, and it was a joy to watch her come to terms with her new circumstances. The stand-out performance here, however, is not Jennifer Morrison. This honor belongs to Robert Carlyle who, with his Defoe-ish sneer and manic energy, plays a great batshit crazy Rumpelstiltskin. He wants your newborn's name, but will you indulge him? Not a snowball's chance in Hell, unless Rumpelstiltskin's allegiance is the only thing you have protecting yourself and the child against evil forces. This isn't a perfect start to a series. Jared Gilmore's acting as the kid is slightly grating, and the screenwriting is occasionally too obvious. 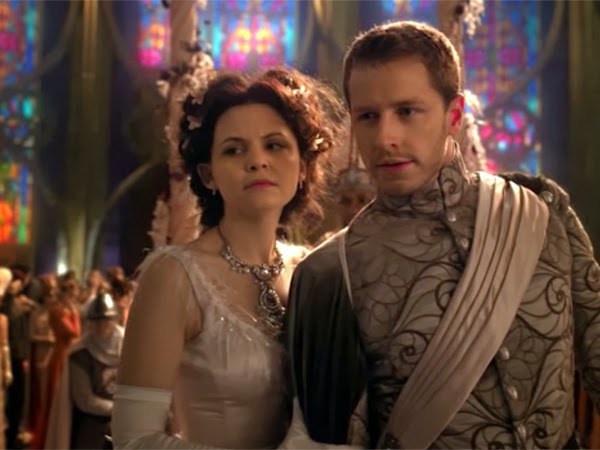 If you are willing to overlook these flaws and the cheesy bits, the first episode of "Once Upon A Time" is solid entertainment, with effective humor and heartfelt moments. I will definitely watch the entire season. I like the unique take on fairy tales it presents. Hi Steph! I actually saw this pilot earlier this year. I quite like it but I've only managed to see about 5 episodes so far. I'm horrible w/ TV shows, I just can't keep up. I haven't even finished Season 1 of Downton Abbey! In any case, totally agree that Robert Carlyle is THE best actor in the series, but it's no surprise really, he's already too good for the show when he's cast.